Research has just discovered that the electrical brain activity of a student who plays a stringed instrument is exactly the same as that of a top executive! Both activities require that the person be highly engaged in complex multi-tasking, and the electrical activity fully lights up all parts of the brain, equally, in both the executive and the string player! However, there is one more important comparison that must be brought to light! It is the comparison between the work of brilliant executives in running a top company, and string players in playing in a orchestra! In a top company all the employees know their jobs and do their jobs at an extremely high level. They work together to bring about the goal of the company, and they are punctual, follow orders, and stay focused to their task. Oftentimes a company executive takes their work home to do extra work to make sure they can reach deadlines, and to produce the highest quality work possible. The work of a member in an orchestra parallels the work of a person in a top level company. To play in an orchestra the player must know their instrument well, and perform at an extremely high level. The player must work together with others to bring about the goal of playing the piece at the highest level. Members are required to be punctual to rehearsals, and even arrive half an hour before concerts to warm up. They pay attention to and follow the orders of their director, the conductor. They are capable of staying focused on their music for often three hours or more at a time. They take their music home and work on their parts to be prepared at the highest possible performance level, for the rehearsals and concerts. Playing in an orchestra therefore prepares students to excel, in no matter what they choose as a career in life! 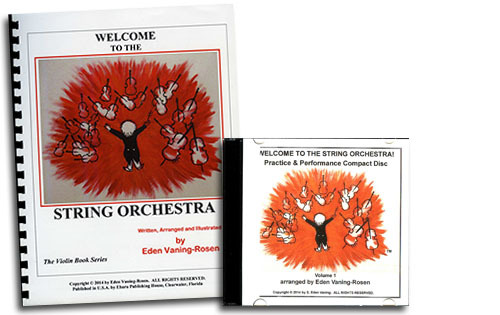 "Welcome to the String Orchestra" by Eden Vaning, is a vital curriculum for all string players, because of the magnitude of it's content. It was written by a string player who has served as "Concertmaster" of 11 orchestras, throughout the country. A Concertmaster is 1st chair, lead violinist! 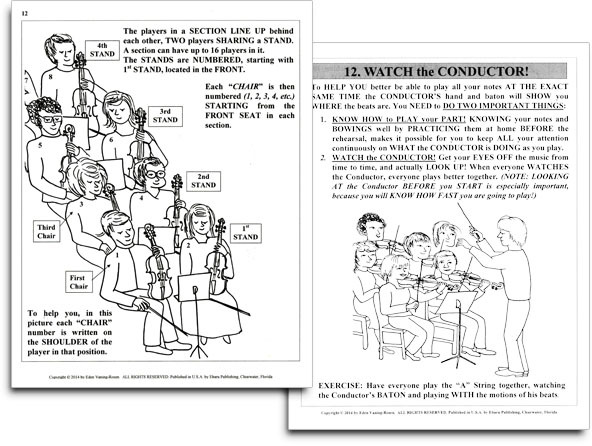 This is the most detailed and thorough Curriculum available anywhere, (an operating manual), on every aspect of playing in an orchestra. There is a description of what is expected of players, auditions, how to follow a conductor, how to conduct, seating, stand partners, concertmaster tasks, stage manners and much, much more. Many students don't learn how to listen or what to listen for, or how then to respond correctly to others in an orchestral setting. Covering the essentials in this curriculum enables all string players to operate at their full potential, and glean the most out of their orchestra training. This book is also vital for adult string players to gain a deeper appreciation and more rewarding orchestral experience.